vary and sometimes striking a balance is difficult. We could shut down all 28 unprovoked American wars of aggression, secure the peace and invest those trillions in people, infrastructure and planet Earth… but this makes entirely too much sense. On November 11th, 2018 Veterans from all over led a March on Washington against ignorance, militarized cops and unprovoked and illegal wars of aggression. Many joined a broad coalition Of Peace, Justice and Freedom Groups To Secure the Peace and Restore Sanity. Saturday, Nov. 10, 2018 – Rally and protest during the military parade along the route. Sunday, Nov. 11, 2018 – Silent march led by veterans and military families. 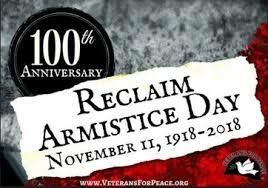 On the eleventh hour of the eleventh day of the eleventh month on the 100th anniversary of the Armistice that silenced the guns of the “war to end all wars,” we marched in silence to reclaim the Armistice Day promise of peace. Catharsis on the Mall took place on the National Mall near the Washington Monument (15th St. and Constitution Ave., NW) all weekend long and included art installations, live music and booths. Veterans held a space at McPherson Square, 15th St. and I St., NW, from Friday night to Sunday night and at the Veteran’s Administration, 810 Vermont Ave. (close to McPherson Square). They had a concert starting at 4:00 pm Saturday, an interfaith service at 8:00 am on Sunday and a rally at 1:00 pm Sunday. They held a BBQ for homeless veterans outside the Veteran’s Administration Building on Sunday night. Location: Capitol Hill Presbyterian Church, 201 4th St., SE, Washington, DC, Fellowship Hall (wheelchair accessible). Breakfast and h was provided. Sunday, November 11, 2018 Marched to Reclaim Armistice Day : 9:00 am – Gathered in the grassy area near the Vietnam Veterans Memorial. Veterans for Peace carried white flags. 9:30 am – March began. March route included the Vietnam Veteran’s Memorial, Women’s Memorial, World War II Memorial and arrived at the World War I Memorial at 11:am. All were welcomed: you did not have to be a Veteran or Military Family Member to attend and all were encouraged to walk behind the Vets. This was a solemn march, while you do not have to remain silent, it is requested to hold the noise level down. Signage, Banners, and Flags honored all victims of wars, civilians, and resistors. White poppy wreaths were left at each site. Taps were blown by fellow Veteran and Sapper, Watermelon Slim. LET US KNOW YOU’LL BE THERE for the next march!